Months of contemplation shyly hides behind this once-in-a-lifetime experience that I am going to narrate. The photograph that plays the lead-role in this narrative is the sole witness that caught me everyday in those thoughtful moments, sometimes minutes and sometimes hours. Radhanath Swami’s Happiness, in Tolerance. 26 November 2009. It was 4:59 a.m. when Radhanath Swami, visibly tired, entered the Radhagopinath temple hall for the morning prayers that would begin in a minute. 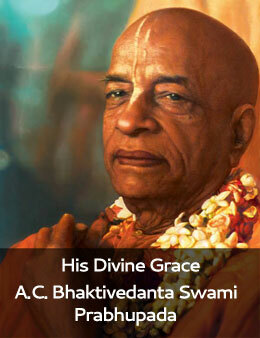 He hurried towards the deity of his Guru Srila Prabhupada to pay his obeisance.